Following the Brazilian Grand Prix qualifying session in which he failed to post a time on Saturday, McLaren Formula One driver Fernando Alonso took a seat and basked in the sun a bit. Little did he know that it would lead to a (hilarious) photoshopping frenzy of “#PlacesAlonsoWouldRatherBe” on Twitter. Update: And it looks like this frenzy started in OppositeLock with our own veteran commenter, reader and Photoshop fiend McMike. How crazy is that? Then came the Oppo post, which apparently spread like wildfire. 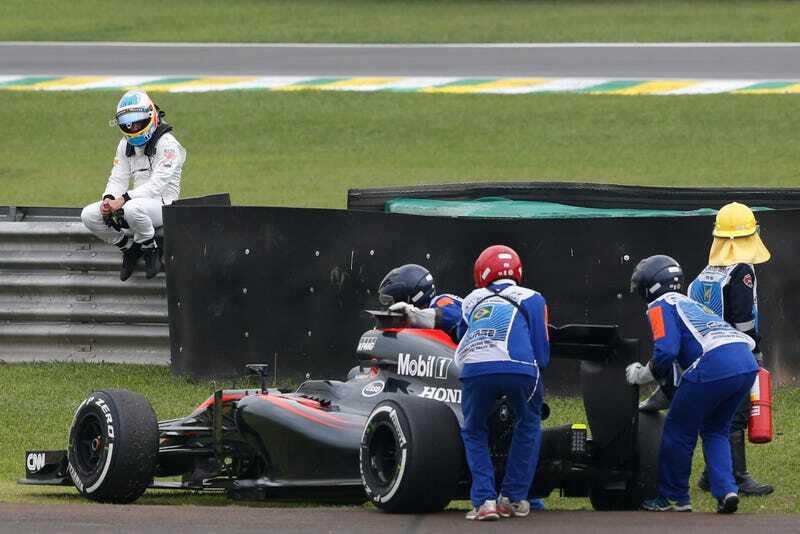 And for fun, a “Where’s Alonso?” search for you. Hint: if you missed out on this earlier in the post, he wasn’t qualifying. Though he’s just daydreaming in this photoshop, Alonso did say that March would hopefully bring a real visit to the podium.